Each woman carries within her the ability to do anything to which she sets her mind. This alluring four-strand bracelet allows each of us to show our confidence in the significant life change Street Business School students are making for themselves and their families. 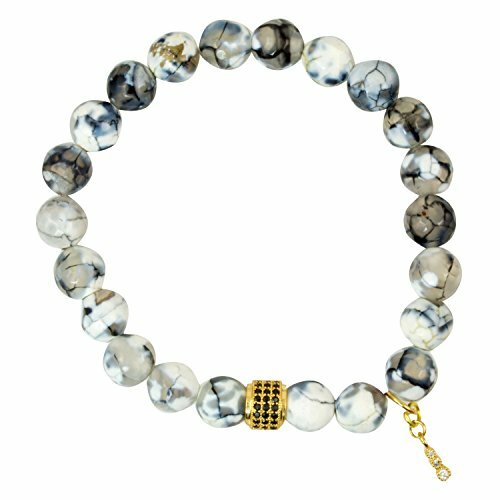 Description: 8mm Faceted White/Grey Crackle Agate Beads with Gold Plated Spacer Bead with Black Onyx Accents and small Crystal Charm - Stretch BraceletLength: Adjustable/StretchType of Stone(s): Agate Metal Type: Gold Plated / Alloy MetalsDesigned By: Peak of Perfection Designs (SKU: POPB-0538G)Please Note: Due to the natural components and handcrafted nature of this product, each item may vary slightly in shapes and colors and may look different based on the angle of the photograph vs. the actual item.Jewelry Care Instructions: To help maintain the beauty of your jewelry, be sure to avoid chemicals like alcohol, ammonia, bleach, chlorine, acetone, hairspray, perfume and cosmetics. Be sure to always take off your jewelry before you apply lotion or perfume or expose it to any water. 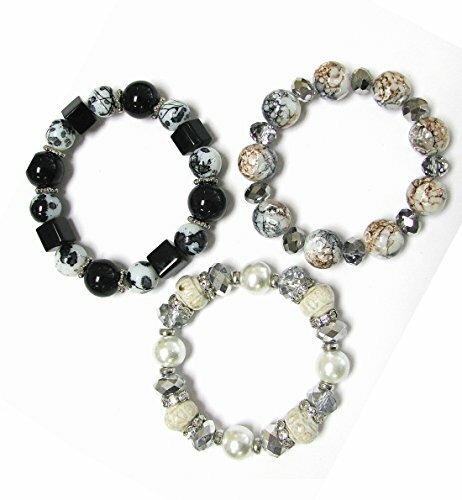 Description: 8mm Faceted White/Grey Crackle Agate Beads with Silver Plated Spacer Bead with Black Onyx Accents and small Crystal CharmLength: Adjustable/StretchType of Stone(s): Agate Metal Type: Silver Plated / Alloy Metals Designed By: Peak of Perfection Designs (SKU: POPB-0538)Please Note: Due to the natural components and handcrafted nature of this product, each item may vary slightly in shapes and colors and may look different based on the angle of the photograph vs. the actual item.Jewelry Care Instructions: To help maintain the beauty of your jewelry, be sure to avoid chemicals like alcohol, ammonia, bleach, chlorine, acetone, hairspray, perfume and cosmetics. Be sure to always take off your jewelry before you apply lotion or perfume or expose it to any water. 2 strand crystal beaded waxed cord bracelet, they are perfect to wear just one or combined with other braceletsPackaged in a pretty jewelry bagIt's perfect gift for best friends. 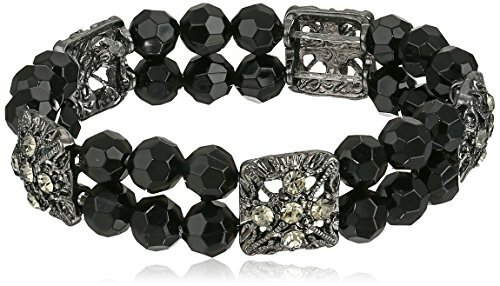 Black & white series of arty lined round glass beads faceted Rondelle crystal cube beads ceramic beads with rhinestones spacers stretch bracelets 3 pieces per set. 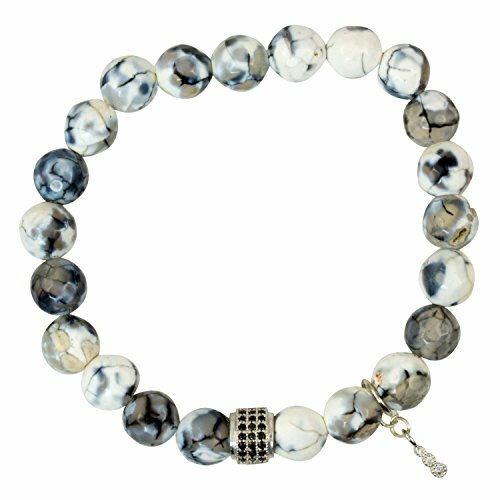 Yoga inspired chakra bracelet contains faceted black onyx crystals with a decorative silvertone ocean seahorse charm. 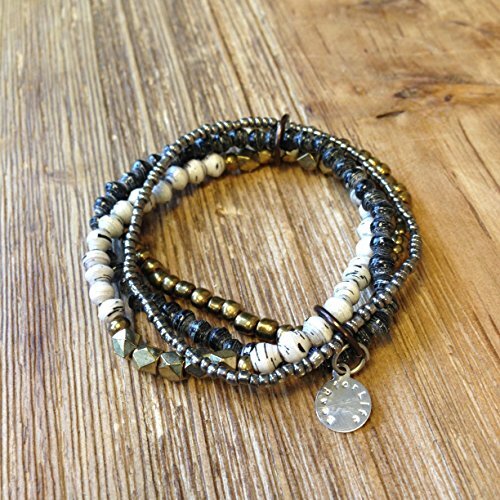 Stretchy and stackable bracelet is both beautiful and meaningful! 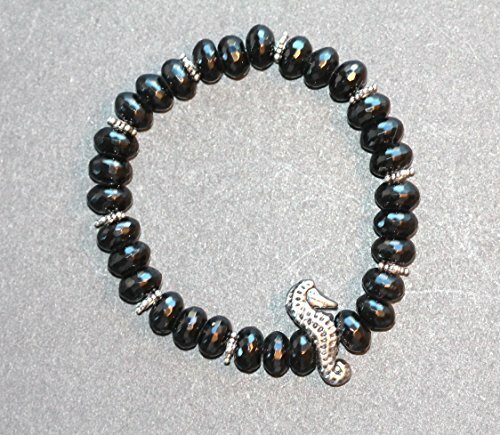 Black will be forever in fashion, this onyx is sparkly and comfortable to wear. Wear your onyx for self protection and to keep away bothersome entanglements, so the literature says. One o a kind, handmade. Will arrive gift wrapped, Prime shipping offered. 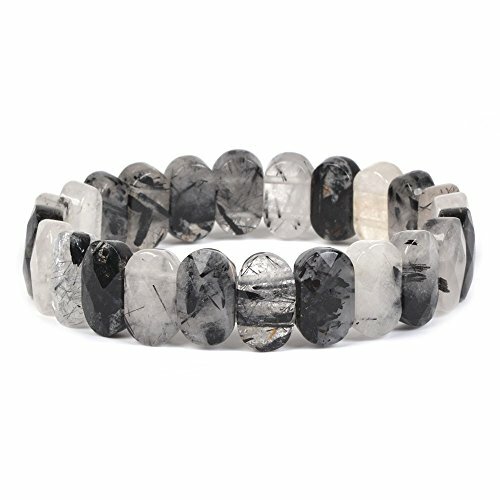 Natural Black Tourmaline Rutilated Quartz Gemstone Faceted 14mm Oval Beads Stretch Bracelet 7"
You will receive the similar item as picture, pls note the stone is unique, the color and detail on stone will be different for each other. Elegant black faceted onyx is beautifully set off by a silver plated filigree heart and round 8mm silver plated filigree beads. This bracelet is stretch for comfort. Compliments any outfit. The beads are 10mm. 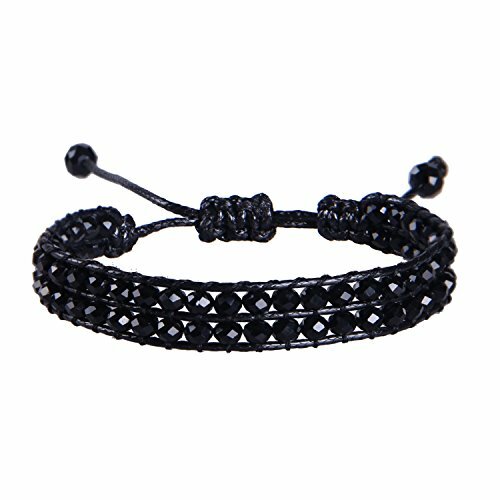 Looking for more Faceted Black Stretch Bracelet similar ideas? Try to explore these searches: Panthers Mug, Gibraltar Angle Leg Clamp, and Scarf Tie Top. 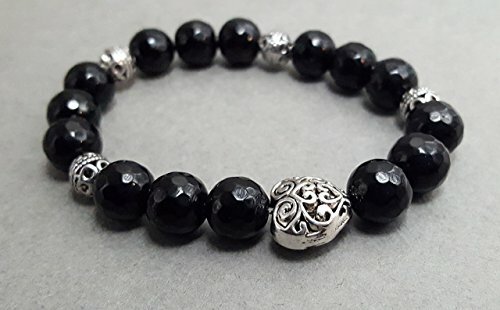 Shopwion.com is the smartest way for comparison shopping: compare prices from most trusted leading online stores for best Faceted Black Stretch Bracelet, Leather Double Billfold, Wilson Glass Print, Stretch Bracelet Black Faceted . 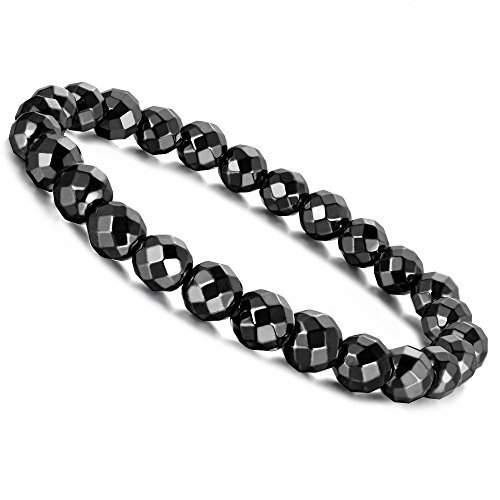 Don't miss this Faceted Black Stretch Bracelet today, April 19, 2019 deals, updated daily.